As I was fortunate enough to sneak in a dinner sans Mia this evening, I was able to enjoy one of the few great pleasures in life, red meat. Beth proposed venison, and I agreed to walk to Savenor's to obtain it. Savenor's is about the size of my bedroom, and, in addition to a few readily obtainable potatoes and fruits, it sells meat. And I'm not even sure it sells regular meat - what it really sells is irregular meat. I asked the butcher for help finding the right cut of venison. We wanted something that we could sear and/or roast such that we could finish eating before Josh Beckett threw his first 12-6 snapdragon for a strike. He brushed off my question by saying that, obviously, any of the multitudinous venison cuts available could be prepared in my fashion, but really what I wanted was bear or wild boar. I was careful to be both contemplative and noncommittal. When he was done explaining how truly stunning the $60 blob of bear meat tastes, I kindly asked him to give me one of the two venison tenderloins that were co-packaged. An uncooked venison tenderloin is an alarming thing to behold. I have pictures, but they're available only by special request and after a background check. 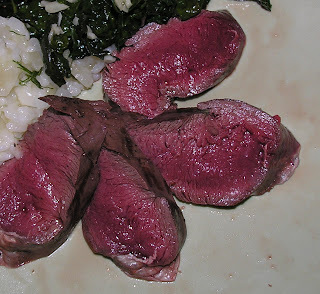 The best description I can think of is that a raw venison tenderloin looks like a common leech, but 20 times the size. Anyway, I did a simple kosher salt and black pepper spice rub, and then, after washing my hands thoroughly, I used the new silicone pastry brush to paint the entire thing with olive oil. I sauteed it over medium heat for about 4 minutes per side, and then we put it in the oven at 450 degrees for another 5 minutes or so. The result was superb. It was the best meat I have ever tasted - tender, free of any gristle that might get in the way of the eating experience, and, most importantly, intensely flavorful. I really have no choice but to urge strongly that you head to your favorite specialty rare meat grocer and try it for yourself.